This is dairy-free and vegan (no eggs!) but it’s as creamy and satisfying as the real deal. 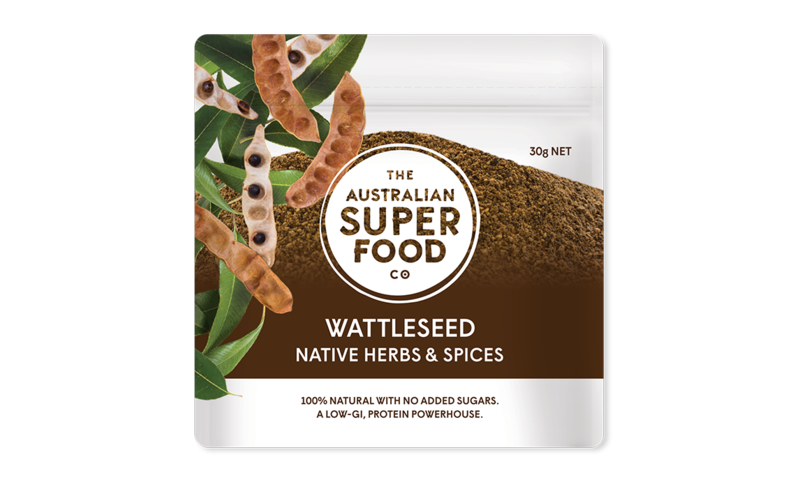 We’ve added Wattleseed because it’s an amazing vegan source of protein AND iron. 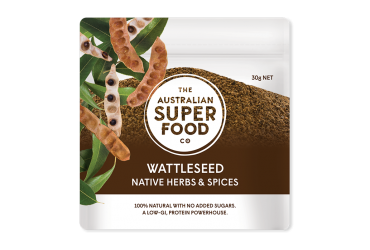 But you can experiment with other superfood powders such as Finger Lime (can you say Pina Colada vegan ice cream?) and Kakadu Plum and choose your favourite toppings. Optional extras: nuts, chocolate (or carob) chips, fruit puree, cacao nibs, etc. The ice cream machine’s bowl needs to be completely frozen before you plan on churning the ice cream. Place the bowl inside the freezer at least 24 hours before you plan on starting. You should hear no liquid moving around in the bowl when you remove from the freezer or else it needs to stay in longer. Shake the cans of coconut milk thoroughly to incorporate the watery layer and the thick layer. Open the cans of coconut milk. Measure 1/2 cup and set this aside. Pour the remaining coconut milk into a sauce pan. Add maple syrup and salt to the coconut milk. Warm the coconut milk on the stove over medium-low heat, stirring occasionally, until the maple syrup has completely dissolved into the coconut milk, approximately 1 to 2 minutes. Measure the cornstarch and Wattleseed and add it to the reserved 1/2 cup coconut milk. Whisk thoroughly until the cornstarch is totally dissolved. This is your ice cream base! Turn the heat up to medium. Stirring occasionally, continue cooking the base until it becomes thick, 6 to 8 minutes. Do not allow the base to come to a boil. Pour the base into a container and let cool slightly before putting in the fridge. Cover with plastic wrap before refrigerating. Refrigerate for at least 4 hours or for up to 3 days. Remove the base from the fridge and pour into your ice cream machine and begin churning. Churn the ice cream until it thickens and has the consistency of soft-serve ice cream. It depends on how high-powered the machine is, but this can take anywhere from 10 to 20 minutes. Keep checking occasionally. If you want to add any yummy extras, add them now and churn a few more seconds until they are completely mixed in. Scoop the ice cream into your freezer container. Press a piece of parchment or wax paper against the surface. This will prevent the ice cream from getting those freezer burnt crystals on the surface. Place the ice cream into the freezer and freeze for at least 4 hours so its hardened. Remove and scoop into bowls. Top with any extras you wish — nuts, cacao nibs, goji berries — get creative and enjoy! 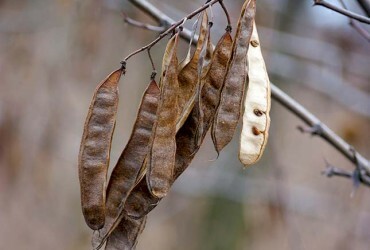 This recipe was originally from the Kitchn and has been repurposed to include nutritious and delicious Australian Wattleseed. 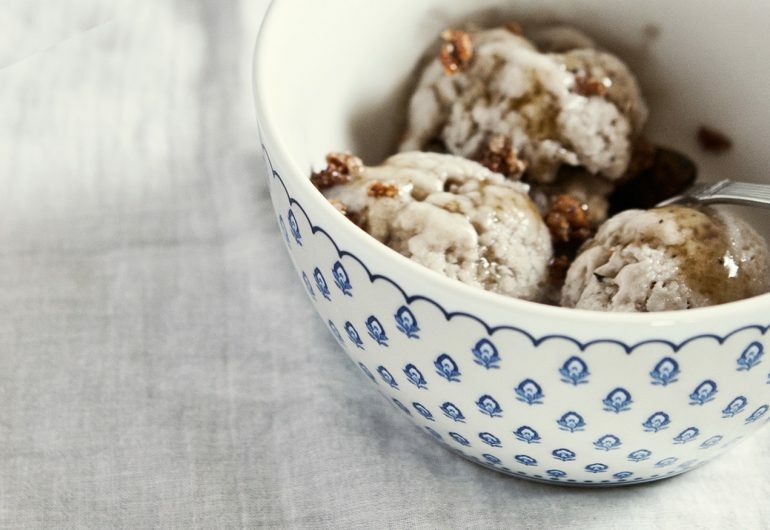 To see the original recipe, visit http://www.thekitchn.com/how-to-make-vegan-ice-cream-cooking-lessons-from-the-kitchn-204755.